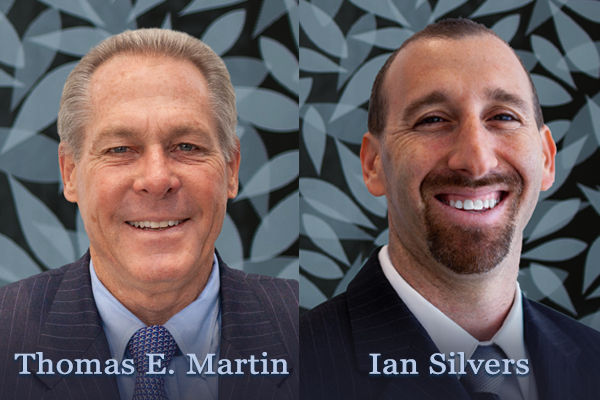 Personal injury law firm of Bisnar Chase has added two more lawyers – Thomas E. Martin and Ian Silvers – further strengthening its proficient team of attorneys. Martin will handle personal injury litigation, and Silvers will take on employment law-related cases. NEWPORT BEACH, Calif. - Oct. 16, 2018 - PRLog -- Bisnar Chase, the renowned personal injury law firm in Newport Beach, has recently welcomed two new lawyers to its team. Thomas E. Martin is an enormously experienced personal injury lawyer, a skilled negotiator as well as a trial attorney while Ian Silvers brings his intricate understanding and considerable background to deal with employment law cases, particularly wage and hour lawsuits. Martin has approximately 33 years of experience as a trial attorney handling all aspects of civil litigation from auto accidents and premises liability cases to construction site accidents and business litigation. Martin maintains that he got into personal injury law "by accident." "My intent was to practice environmental law," he said. "But I got hired by an insurance defense firm and it became clear to me that trials get me going. What I really enjoy about this area of work is trying cases and winning for our clients. It gives me tremendous satisfaction to play a part in helping injured clients secure the justice and compensation they deserve." Silvers has a decade of experience in employment law. Since 2013, he has been successfully handling wage and hour claims for a Long Beach-based law firm. His zeal, Silvers says, has always been to help people, especially those without the means and resources to proceed with their cases. "I could see that in employment law matters there were so many employees who did not fully know their rights and as a result were being taken advantage of by their employers," he said. "However, these same employees were not always able due to various factors (including financial reasons) to take action against the employer, whether it was a lawsuit for wrongful termination, discrimination, harassment or wage-and-hour matters." Both Martin and Silvers have a passion for giving back to the community and say they have always admired Bisnar Chase's substantial efforts to continually help the community. "Many firms focus only on their cases and the business, but Bisnar Chase regularly focuses on what it can do to help the community, whether it is donating their time, backpacks, knitting items, or a variety of other charities they contribute to not only financially but also with their time," Silvers said. The Veterans of Foreign Wars (VFW) Dana Point recently honored Martin for his pro bono work in assisting a number of veterans. Brian Chase of Bisnar Chase said that he views both Martin and Silvers as tremendous assets to their team of attorneys. "We take a great amount of pride in having created this wonderful, high-energy space where individuals can learn and grow without limits," he said. "We are thrilled to add these two accomplished attorneys on our trial team." Bisnar Chase represents victims injured by defective products and by acts of negligence. The firm has been featured on a number of popular media outlets including Newsweek, Fox, NBC, and ABC and is known for its passionate pursuit of results for their clients. Since 1978, Bisnar Chase has recovered hundreds of millions of dollars for victims and their families. For more information, please call 800-561-4887 or visit http://www.BestAttorney.com for a free consultation. We are located at 1301 Dove Street #120, Newport Beach, CA 92660.